This ingenious system has been invented by Jurg Steiger, a well known precursor in growing temperate Pinguicula. J got all my experience in temperate pinguicula by reading his publications in ICPS and relative journals. I have two experimental walls and I am still working to improve the system. 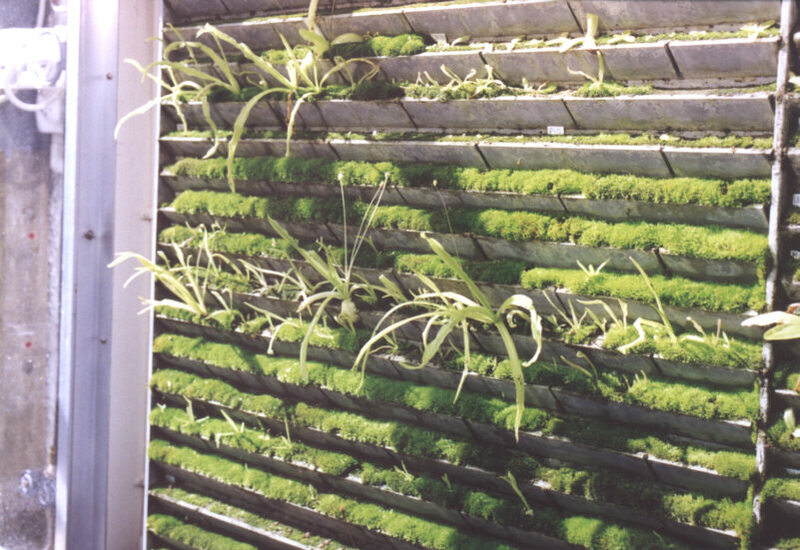 It is very difficult to provide a good amount of light for the plants and in a same time to keep the wall cool in summer. My two experimental dripping walls. I use some test plants for the experiments (sorry). I choose Pinguicula grandiflora ssp. grandiflora, a prolific species that gives many gemmae each year. "I live in Central Europe, in a suburb of Bern, at 600m, 25km north of the Prealps. Summer maxima reach+30°C, winter minima -15°C. I grow most Pinguicula on vertically positioned PVC sheets (20mm thick) equipped with horizontal 'lamellas' put into 45° angle slits. The vertical distance from lamella is 40mm. The lamellar sheets are fixed within a greenhouse along the north-east wall of his house which is surrounded by some trees on the east side. From mid-December till mid-January the plants do not get any sun at all. In summer they get 1-2 hours of sun in the morning when the sun appears between the trees and the projection of the roof. A timer allows water to trickle from time to time though the substrate which never be too soggy (to avoid rootness). The greenhouse is divided into three climate compartments. In all three compartments there are fans to produce wind for 15 minutes each hour and ultrasound fog machines to produce high air humidity. 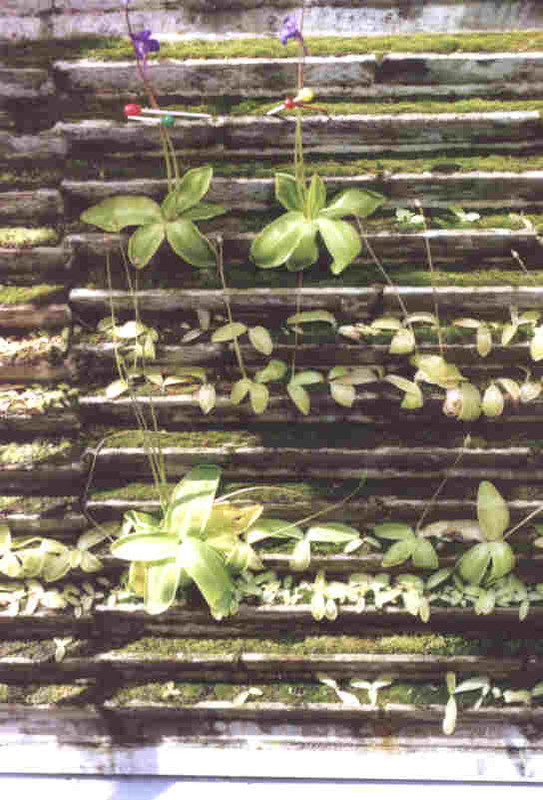 Pinguicula grandiflora and others specie in the original dripping wall of Jurg Steiger. Pinguicula vallisnerifolia in the original dripping wall of Jurg Steiger. 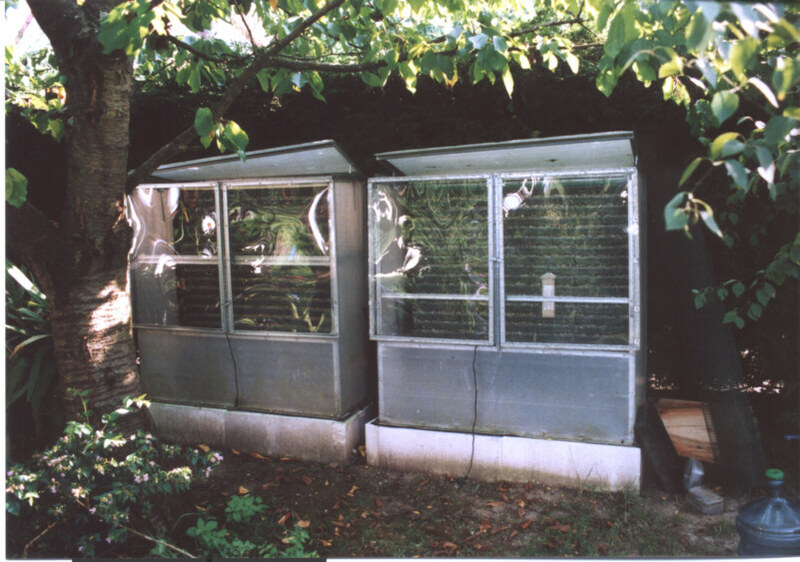 Compartment A is kept open all spring, summer and autumn but closed and slightly heated in winter to avoid frost (winter temperature +1° to +8 °C). In this compartment I grow the Isoloba species (P. crystallina/hirtiflora and P. lusitanica). Compartment B is kept open all the year except in winter days with heavy frost. In light frost it is open allowing the substrate to get slightly frozen. In this compartment I grow P. vallisneriifolia, P. longifolia ssp. caussensis and subsp. reichenbachiana, P. dertosensis, P. mundii and P. macroceras ssp. nortensis. Compartment C is kept open all winter except in heavy frost but closed from spring to autumn. It is cooled with a professional cooling system allowing e.g. a night temperature of +5°C and a day temperature of +10°C even if it is 25°C or more outside. Household air conditioners are useless as their compressor is not constructed for temperatures below 18°C. In this compartment J grow P. alpina, balcanica, corsica, fiorii, grandiflora, leptoceras, longifolia ssp. longifolia, macroceras, nevadensis, ramosa and vulgaris. These species are infested by fungi if not exposed to an ultraviolet source. From mid-June to the end of August P. variegata and villosa (and hopefully in near future P. algida) are grown in a horizontal refrigerated box similar to those used in food markets. 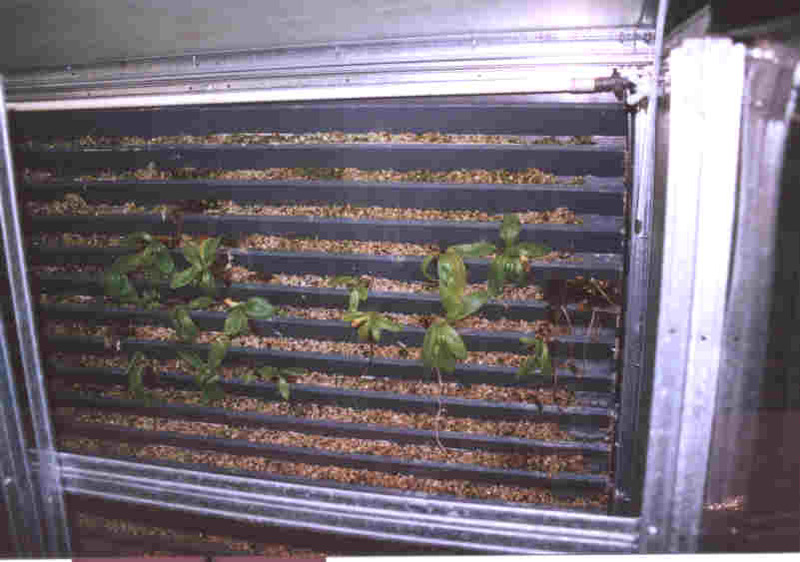 As the air humidity is constantly reduced due to the condensation at the surface of the cooling pipes, the entering cooled air must be rehumidified to at least 70% relative humidity. From the beginning of September to the beginning of June the named species are kept in a deep freezer at -15°C."